This week’s BEACON Researchers at Work blog post is by MSU graduate student Paul Wilburn. A cold shiver and briefly clenched teeth are common quick reactions displayed by new acquaintances when informed that I drill lake ice in Siberia for a living. Perhaps mental images of cold, biting winds, clumsy mittens and tools that freeze from exposure can instantly overwhelm. They are likely the opposite of a dream job, like collecting tropical water samples to bring back to a cooler under a palm tree on Carefree beach. But then I turn their attention to memories of Jack London’s White Fang or Call of the Wild. Recall the vast Nordic landscapes, endless frozen boreal, divided into wolf pack territories by the Yukon, Klondike and the McKenzie rivers. Where wolves, dogs and humans alike are forced by the unforgiving wild to find their place in a primal land, bound by the law of meat. It is a place where distractions are unthinkable, where survival, competition and procreation come to the surface. Life and death are exposed, and the perseverance to exist is more straightforward. The explicit nature of this system is what attracts biologists, like me, to uncover what it takes to survive the harsh abiotic conditions for some of world’s most exotic organisms. To answer this question, I study extremophile microorganisms endemic to Lake Baikal, Siberia. 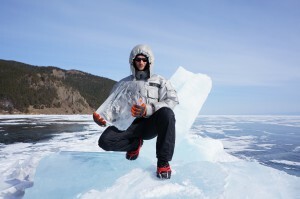 Lake Baikal is a UNESCO world heritage site and the planet’s oldest, deepest and most voluminous lake that holds about 20% of the world’s unfrozen freshwater. It is historically cold year-round, although the region is predicted to experience rapid warming. Baikal has about the surface area of, and is ten times deeper than, Lake Michigan. And while the American Great Lakes were formed by melting glaciers about 15-10,000 years ago, Baikal fills a tectonic rift and clocks in at 30 million years old. 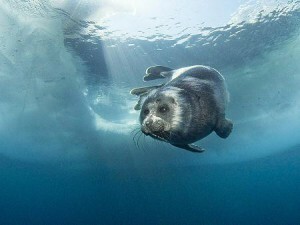 Partly because of its age, Baikal is an island of biodiversity, marked by high endemism from algae to the top predator, the world’s only freshwater seal that lives only in lake Baikal and nowhere else. Endemic organisms, like the seal, are Baikal specialists that evolved over millions of years to dominate the ecosystem at all trophic levels. How do they do it? Given the millions of years of evolution, endemic species likely developed streamlined metabolic adaptations to unique Baikal conditions, like constant cold. Indeed, Baikal is frozen for four to five months out of the year, and the peak summer temperature goes above 10 degrees C for perhaps a week or so. Thus, I am particularly interested in molecular adaptations of Baikal endemic microorganisms to constant cold. The first part of my thesis project is to determine the distribution of endemic microorganisms at multiple locations in the lake. 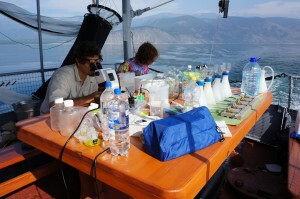 While the open waters are dominated by endemics, the shallow bays, some of them quite large, along Baikal’s 2000-kilometer coastline are inhabited by microorganisms with cosmopolitan distribution. But no one has used molecular tools to systematically survey the lake and determine relative abundances of endemic and cosmopolitan taxa at different locations. In Summer 2013, I joined a 12-day “circum-Baikal” research cruise and collected samples from 52 locations along with abiotic metadata on temperature, light and nutrient content. Using amplicon metagenomic methods, I will estimate relative abundances of endemic and cosmopolitan taxa and associate them with the abiotic conditions, like temperature. I would expect endemic and cosmopolitan organisms to dominate cold and milder locations, respectively. The data will also tell me something about standing variation in various microorganism populations, and thus their potential for evolution in the scenario of rapid disturbance, like warming. The second part of my thesis is to get some insight into the actual adaptations of Baikal endemics to constant cold. 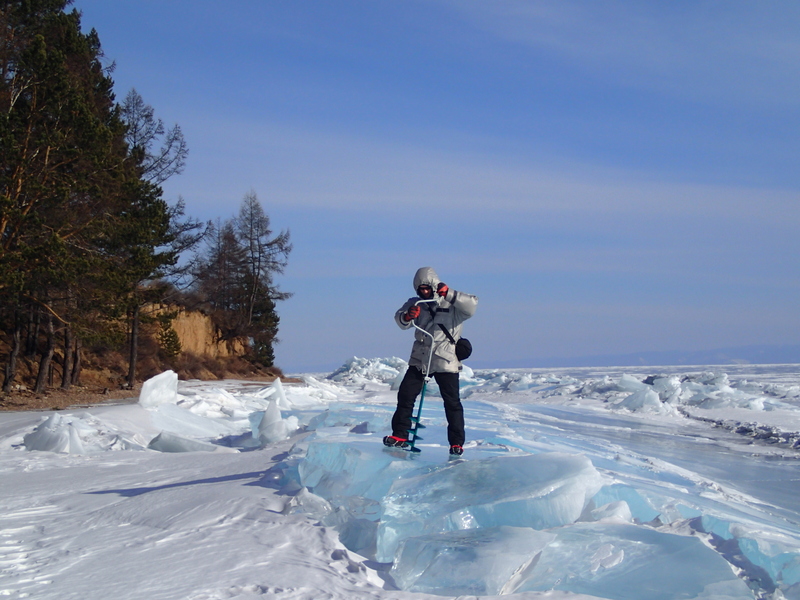 In Winter 2013, I spent three weeks on frozen Baikal, drilling the ice and collecting samples for shotgun metagenomic analyses (Figure 3). Shotgun metagenomics is a method to sequence and assemble draft genomes of all organisms in the collected sample. About two dozen molecular adaptations to constant cold have been described for polar organisms, like Antarctic fish and diatom algae, in the literature. These adaptations are coded in the genome and will be visible in the assembled data. Examining draft genomes of endemic organisms will give me clues into possible strategies used by endemics to successfully dominate Baikal. For the third part of my thesis, I will use transcriptomic methods to refine a mechanistic picture of how endemic and cosmopolitan organisms deal with cold and warm temperatures. For this step, I will grow microorganisms in culture and look at the genes they express. With metagenomic information as reference and transcriptomic information on gene expression, I will be able to tell if endemics use some genes more or less than cosmopolitan species. These findings will experimentally confirm proposed strategies used by contrasting microbial taxa to grow in constantly cold conditions. Shallow bays and small lakes all around Baikal are full of weedy temperate species. What keeps them from invading and overtaking the pristine Baikal ecosystem? What happens if Baikal warms up in the near future? These questions are central to my thesis. Understanding the molecular mechanisms of cold adaptation in Baikal endemic and cosmopolitan species will give a mechanistic picture of their differences. Future work will focus on quantitatively predicting the relative success of these different microorganism groups in different environments. For more information about Paul’s work, you can contact him at wilburn4 at msu dot edu.